For me it's actually the opposite, I don't mind working on my lower level alts, because they can continue to slowly work their way through the tiers. However, working on a hard to get best-in-slot set that will cease to be so very shortly feels pointless. I must confess, I just can't understand BW's (currentish) plans for gearing, even before everything went pear shaped. It appears they are going to revert to (mostly) status quo ante, only with an even wider and more bewildering range and selection of components. 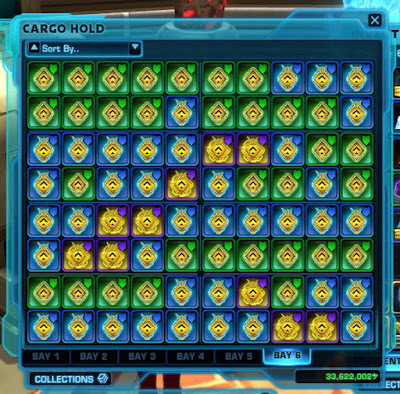 At least the last stream promised a QoL improvement in the vendor interface. To late for the 100 unassembled components I blew buying a wrist slot piece for the wrong advanced class, despite staring at the vendor interface trying to figure out which one I should be buying. IE, an armor piece I could never use on that character, even if I respecced. And, of course, all sales final. They simplified gear acquisition. Which only was needed in some areas (though it was needed), and they very nearly threw the baby out with the bathwater. But, what they didn't do (and ended up making worse, was simplify gear use. Itemization is a worse mess than it was before, except that PvP gear is not a completely separate upgrade chain (and because they didn't make PvP "need" as much Accuracy as PvE, they screwed that up too at the BiS level). Not to mention adding too many gear levels, too quickly, for no other reason than "because we can."